As someone who was raised in a Muslim household but has stopped practicing Islam, I have a unique perspective on the religion. For example, I tend to be more critical of Islam than a practicing Muslim, but the careless political rhetoric of the last month has been incredibly disturbing. Absurd it may be, it is still terribly dangerous. The Niskanen Center, a nonprofit libertarian think tank based in Washington, D.C., published an article compiling recent statistics that shows how fantastical and unwarranted the attacks have been. Even more importantly, they demonstrate how little we know about American Muslims. Using both Pew surveys and Gallup polls, the center strung together several studies to show how Muslims’ views stack up against those of other religions. Interestingly, while some statistics are mentioned here or there in articles, in general, there is surprisingly little research into the beliefs of Muslims in the U.S., in part because they comprise a fairly small percentage (about one percent) of the entire population. If you have wondered how to help your Muslim neighbors and friends against Islamophobic attacks, you may want to start by educating yourself on the small number of existing polls and surveys. Here’s a spoiler: They reveal that almost no American Muslims hold many of the radical beliefs attributed to Muslims and used to stoke fear. For example, a Pew survey in 2011 found that like 64 percent of U.S. Christians, the majority of Muslims also believe that different faiths can lead to an eternal life. In other words, most American Muslims think there might not be just one right religion that brings salvation; a drastically different view from ISIS. Another allegation often levied against Muslims, and part of the reason Muslims are repeatedly asked to condemn terrorist attacks, is that some believe that Muslims support the efforts of Islamic radicals. How could they not? Aren’t they following the same religion? But Gallup’s 2010 survey of American Muslims found that Muslims were the least likely of any religious group to identify with other members of their religion abroad. In contrast, 81 percent of Mormons strongly identified with “those worldwide who share [their] religious identity.” Protestants, Catholics, and Jews all came in before Muslims. Even more telling, more than any other religious group, Muslims are the most likely to condemn violence against civilians. Here are the statistics. In its 2010 survey, Gallup asked whether military killing of civilians is ever justified. Individuals had the option of answering Never, Sometimes, and Depends. 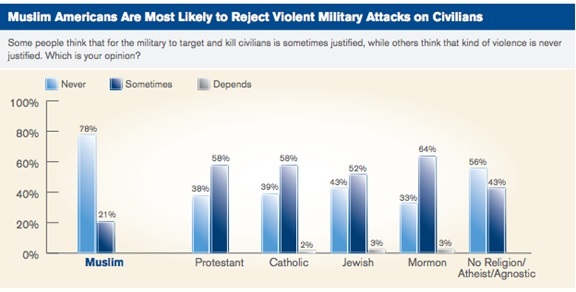 Remarkably, 78 percent of responding Muslims said violence is never justified against civilians. The only group in the study that comes close to condemning violence with such adamancy are people who belong to no religion (including atheists and agnostics), of whom 56 percent think violence is never justified against civilians. These statistics illustrate a drastically different picture from that which is painted by certain public figures. 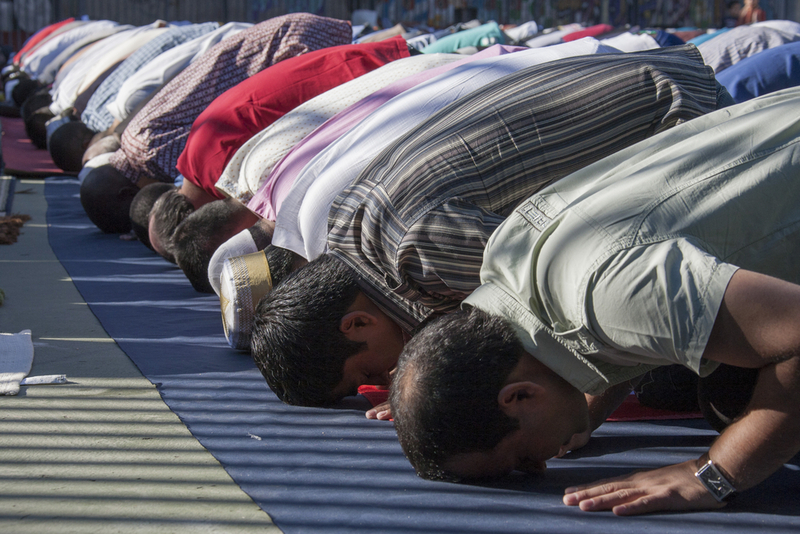 These surveys show that some Americans woefully misunderstand Muslims. There is much more in the Niskanen Center’s report. But what should we do with these statistics? Perhaps most importantly, we must recognize how little Americans understand about their fellow Muslim citizens. There studies speak volumes about how the character of Muslims is often lost in the conversation. Muslim Americans not only follow Islam (and some more devoutly than others), but they are also American citizens, employees, employers, lawyers, teachers, doctors, scientists, journalists, and military personnel. Lest we were at risk of over-sentimentalizing the Obama era, Princeton University-based Professor Cornel West is there to snap us back to mission.